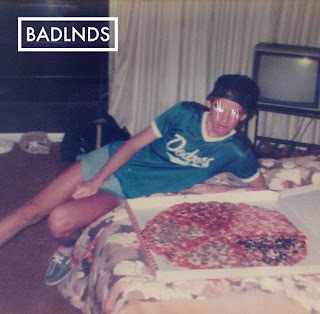 The self titled album by Huntington Beach based band Badlnds is a little juggernaut of an EP. The indie / surf rock genre is a big wave and it can be easy to get kind of swallowed up but Badlnds pulls you in with deceptively catchy musical flourishes and inspired vocals by Thomas Waale. I like the fact that he pushes his voice to it's own edge. Listen to the big sound of Can't Stay Here. There is a big scope, epic feel to it. It's got a beachy fire pit thrashiness and youthful passion. Badlnds also possess a pop influenced sound like in the first track Distraction. Well crafted with a kind of mass appeal sound it balances precariously between indie, 90's post rock and tween sounds. No, it expertly balances that line. It has verve, passion and a big sweep. For some reason I thought of the Drums a bit during this song. White Noise veers headlong in to sock hop punk sounds. The bass is sultry, drums solid and guitar leads are delicious as hell with a section that dances on dissonance so very well. Waale's vocals shine too. The track Money ties in nicely with White Noise and I love the grit on the vox and stacked guitar sound. Somewhere New has that driven big sound like Can't Stay Here and equally full of passion and guitar hooks. I mentioned the Drums. While listening other bands popped in my head. Dante Elephante, The Buttertones, Froth, Audacity and the Cosmonauts. I also thought of some old school 80's bands. I have to really give kudos to not only Badlnds approach to their music but the songwriting. In the end, the songs, the writing is what hooks you into the band's story, their musical experience that becomes your emotional experience and these songs make you feel something. The music bolsters the lyrics as it should. It looks like the music is penned by Waale and Noah Kurtz and the lyrics are penned by Waale. Truly good stuff guys. I implore you to check out Badlnds. Oh, by the way, I gotta share my thoughts on the name of this band. Simply put. I hate it. Just my opinion but when I listen to them, the name of the band doesn't match. On top of that, if you google it- you are lead to other bands named Badlands or all manner of other topics, movies etc with that name. The phrase / name is too common for a band as uncommon as (eh) Badlnds. Man, I am really loving these songs.